Here’s yet another post only a Sunday School Teacher could love. I made a portable Torah Scroll for a preschool Simchat Torah family program a while back, to demonstrate “What’s in the Torah.” The idea was to let kids fill the Torah Scroll with objects that represent some of what is—you guessed it— in the Torah. The activity can be tweaked to fit many age groups, and the more irresistible the objects, the better. 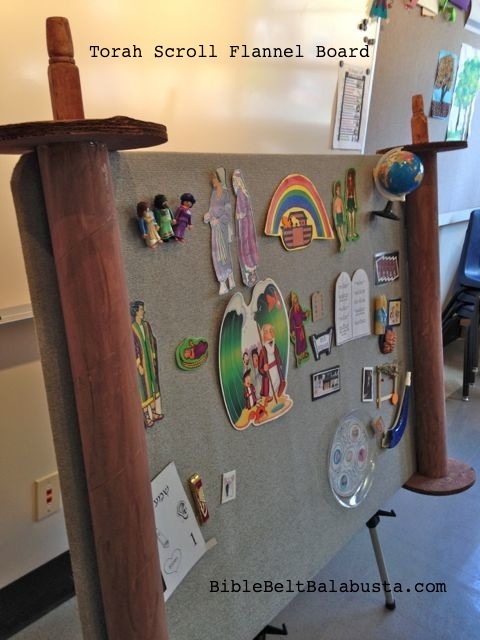 I prepared little thingies with adhesive velcro on the backs, so kids could approach and add a visual marker for a particular Torah story or Torah hero, a holiday, or mitzvah. 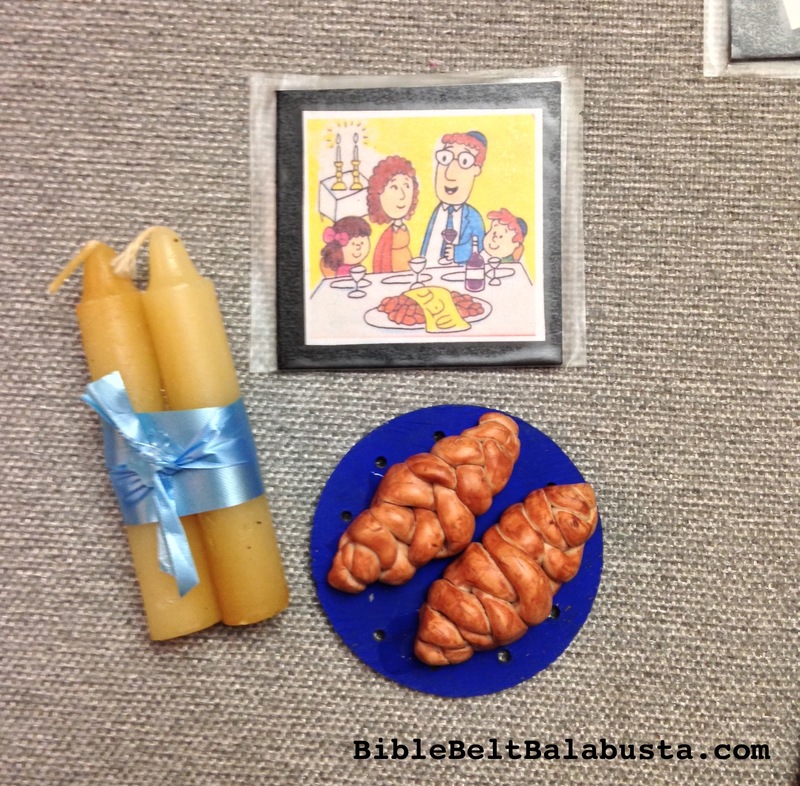 Here’s a pic of a trio of objects for “Shabbat:” two candles tied together, double challah (made of air-dry clay) on a plate, and an illustration of a family at Shabbat dinner. Although I used flannel sets for the Creation Story and Story of Moses, the most popular add-ons were 3-D objects like little dolls and toys. A Playmobil man and two women became Jacob with Rachel and Leah (the velcro peels off later, so they can go back to being Playmobil people in the toy bin). I made a sukkah out of craft sticks for the holiday of Sukkot. Shavuot got a clay ten commandments tablet, Rosh Hashanah a plastic shofar and a honey packet. Complete list below. To Make Board: I happened to have a giant, fuzzy bulletin board lying around, but you can use any big flannel board, or make your own out of rigid board (foam core, S-core, cork, whiteboard) wrapped with yards of felt. Hook-y velcro dots will stick to felt. 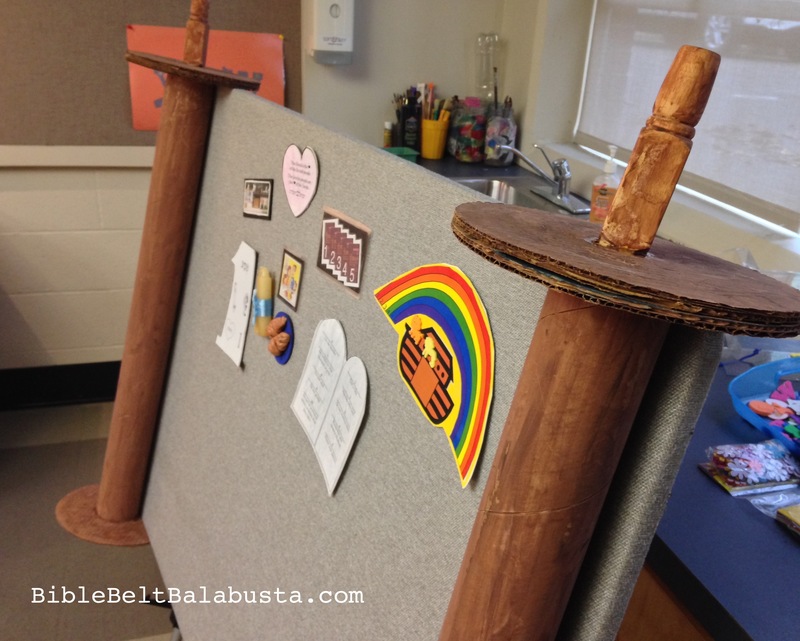 Rollers: My wooden rollers (eitzei chayim=trees of life) are cardboard tubes from fabric bolts, slapped with brown paint and stuck to the board with velcro. The circles are cardboard, and the handles are wooden finials from the craft store, all painted brown. I had handles on the bottom, too, but they kept falling off when kids took the board off the easel. I also made little illustrated examples of several mitzvot, named in English and Hebrew, but I’ve lost them. Dang. And, I stuck velcro on a kippah (yarmulke) and an individual tzitzit (the fringe on the corners of prayer shawls), but I’ve lost those, too. Guide: I photocopied of each object and stapled the pages in order, to make a booklet guide to “What’s In the Torah.” Everyone got to add at least one thing to the scroll, and the booklet helped me make sure no kid got left out. My list is far, far, far from comprehensive, but the activity is a nifty way to introduce students to the idea that the Torah is— to put it mildly—foundational. 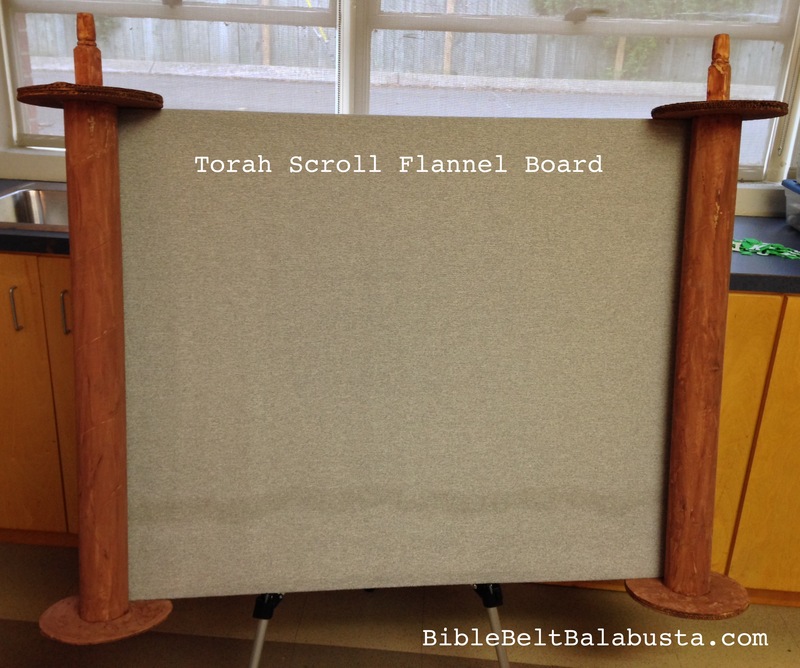 Other uses: A Torah Scroll Flannel Board would be good in a children’s Shabbat service, to show visual clues to the weekly parsha, and to host any flannelboard Torah story anytime. My one rule would be to keep it Torah-specific: not to use it for stories that originate elsewhere in the Tanakh or Rabbinic literature. This entry was posted in Activity, Shavuot, Simchat Torah and tagged Torah. Bookmark the permalink.